Join the discussion on our forums! 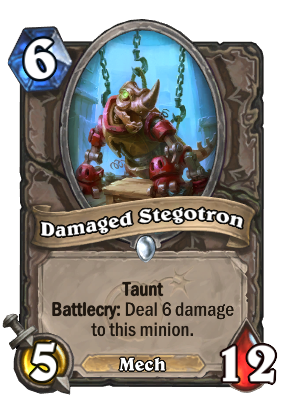 Come discuss Damaged Stegotron over in our dedicated Damaged Stegotron discussion topic. Battlecry: Deal 6 damage to this minion. Sadly the warranty does not cover fireballs or acts of Boom. Thinking of running two of these alongside Woecleaver and The Boomship, as well as various other Warrior cards that are good in general (namely Frothing, Mountainfire and Blood Razor with Forge of Souls) as well as a Witchwood Grizzly. Plenty of single-target removal as well, and 7 or so other 5~9drops to boot plus maybe a single Supercollider and Omega Assembly. Midrange warrior. Tools galore. Hope it works well, 'cause paying for all the new mechs and making a Mech Warrior deck instead will be awful lol. Great synergy with Divine Hymn, great cube target as well. This is better than Unpowered Steambot for Inner Fire Priest and for Lady in White decks. Unfortunately, it costs 6 so it can't be used in an Odd Priest deck. It would be really strong with the upgraded hero power. Imagine Witchwood Grizzly. You don't always play this, forcing the battlecry, sometimes you pull it from hand, deck or even revive it with Abominable Bowman etc. This is the same case. Pull it from The Boomship or just revive this with Kangor's Endless Army. I can picture this being better in paladin than warrior imo. Ow... it's a -tron... Still reading -don. Right, with the legendary spell. A true man of culture.